Legionella Control Internationals legionella risk assessment checklist is designed to help the responsible person audit the arrangements in place to control legionella in the water systems at their premises. The audit provides a very useful check on the responsible persons knowledge of the systems under their control. Additionally it also checks the knowledge of those who play a role in controlling the risks from the system. This can include water treatment contractors, external consultants and product suppliers. There would be no value in asking a third party to complete this checklist. As the legionella responsible person, they will have been appointed because they have sufficient authority, competence and knowledge of the systems in their workplace. They must also understand the measures required to control risks from legionella and Legionnaires’ disease and have the experience and authority to implement and manage them. The checklist does not form a legionella risk assessment. It has been prepared on the basis that the responsible person has already identified a risk system or risks in their workplace and that they need to put in place (or review) measures to prevent or control the risks from exposure to Legionella bacteria. The legionella risk assessment checklist takes you through the recommended measures in the Health & Safety Executives (HSE) Approved Code of Practice ACOP L8 dealing with the control of Legionella bacteria in water systems. It allows you to audit the arrangements you have in place or intend to put in place. Please note that a negative answer to any of the questions in the checklist indicates that you need to review the arrangements you have in place. 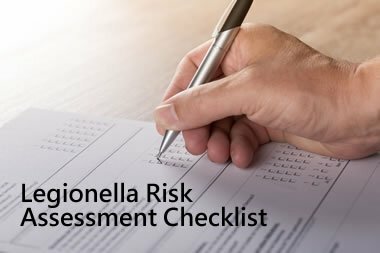 Using this legionella risk assessment checklist requires you to carry out both a physical inspection of your water systems as well as examining the legionella management plans and procedures, and paperwork in place. You also need to talk to those who may have responsibilities for any aspects of the control regime. In the UK all businesses have a legal duty to ensure the buildings, facilities and equipment under their control are safe from legionella growth and the dangers that can come from Legionnaires’ disease. This means that they need to carry out a risk assessment, which is recognised as an essential first stage in managing their risks. Legionnaires Disease – Which Business Sectors are at Risk?